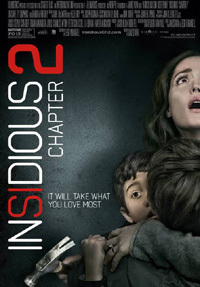 Wannell and Wan continue their successful writer-director collaboration with this admirable sequel to the chilling Insidious. While the first Insidious was an amazing standalone movie, naturally its success and fan excitement warranted another chapter. I always feel a bit dubious when it comes to sequels (my experience in the past with classics like Friday The 13th, Poltergeist and A Nightmare On Elm Street resulted in great disappointment when the second cash-in part was produced). But in this case it really added to the first, with some amazing tie-ins of events from its predecessor. The Lambert family is still the subject, but with their son's ordeal resolved (with some casualties), the focus turned on the father Josh, whose contact with the supernatural goes back to the mid-'80s as a child (his paranormal connection and abilities suppressed under hypnosis). Their new baby daughter is also under threat of dark forces. The Bride In Black who appeared in the photographs across Josh's life and sealing Elise's fate, is far from resting. This entity is bent on possessing Josh. With their lives in the balance, the spiritual realm of The Further is again entered, where the real Josh is trapped, but Elise is also there (the psychic who died at the end of part 1). With some very clever writing, many of the scenes from the first film is integrated perfectly. Retaining that moody, dark and scary feel of the first film, this is a great modern horror sequel worth watching.